Since graduating from my Fine Art Degree in 2008 I have volunteered with the Biennial contemporary arts festival and worked in the Bluecoat Arts Centre. I have also worked in a number of schools and a Pupil Referral Unit as an Art Facilitator for 14-16 year olds who had been excluded from school. 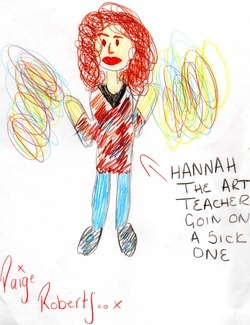 Since September 2010 I have been a freelance community artist working primarily with schools in the northwest of England, but also in nurseries, private companies, NHS trusts and PRUs. I love to create original artworks and am passionate about inspiring others to user their imaginations and creativity to the full. I have an up to date DBS check and public liability insurance. "We are thrilled with the mosaic Hannah and the children have created. She worked closely with us to capture the children's drawings and create a composite mosaic to commemorate the first world war. The children loved working with her each week, using a range of different techniques and tools. Hannah was really keen to help us document the children's learning for their Arts Award Discover Award. I would unreservedly recommend Hannah and look forward to working with her again at Peover Superior. "